Smart donors with deep pockets have a practice of matching donors’ gifts dollar-for-dollar. This is something parents can do with their children, no matter the ages of their children. If you have kids, they probably know about recent events in Japan. And they probably are concerned about the trials people are suffering. But is there anything they can do about it? Young kids have great attitudes. They don’t often worry that their efforts, however small, are insignificant. This should inspire parents. And parents can build on the charitable inclinations of their kids. They can talk about concrete needs and specific organizations that are in the best position to assist with those needs. They can support their kids’ desire to help by offering to match their contributions by some multiple of every dollar they give or raise for charitable support. Two organizations impress me as most worthy because they are best organized, most experienced, and most fiscally responsible and efficient. They are Samaritan’s Purse and the American Red Cross. So one option is for parents to invite their children to consider what they can give and tell them that whatever they give will be matched by five or ten or twenty or a hundred additional dollars. If you have a seven-year-old who is prepared to sacrifice $5.00 he’s saved for something else, then you might offer to match it with $100 for each dollar. Explain to him how each dollar he donates creates an additional $100 of support to meet needs in Japan. This can sound a little abstract if you don’t illustrate with concrete goods that will be supplied or numbers of people who will be helped. So you’ll need to do your homework. Try to determine what your $100 will cover and communicate this to your kids in ways that will make sense to them. Challenge your older children to give more. You may have to match their contributions with fewer dollars because of your budget. Here’s another idea. Begin setting a portion of your charitable giving aside for emergencies that arise. Place this portion in a fund that will accrue interest or in a stock portfolio. As emergencies arise, you will already have available a measure of money designated for giving in times of emergency. Fidelity Investments, for example, has a Charitable Gift Fund. You can open a Charitable Gift account, select the type of portfolio you wish to contribute to, then make deposits to this account according to your own schedule. The funds you deposit will rise and fall with the vagaries of the market and the portfolio you adopt. Your tax deduction for charitable giving is for the year in which you make the deposit. Once the money is deposited, it cannot be withdrawn. At the time of your choice, you decide whom to support and for how much. You then authorize Fidelity to post a check to the designee, charging your Charitable Gift account for the amount you have designated. It’s pretty simple and a great way to apportion your giving for special needs, whatever they may be. Of course, you can combine this idea with the matching idea, and get your children involved in regular giving. They can help you decide when it’s time to give to a particular cause. And they will, no doubt, be sensitive to needs that aren’t on your radar. 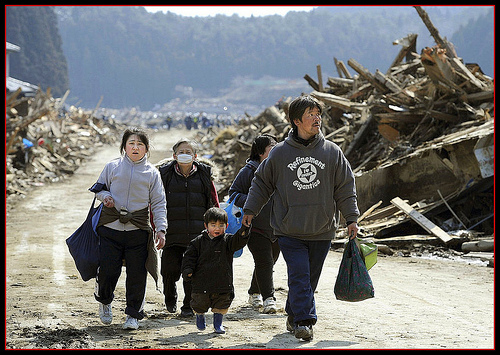 If you have other ideas about how families can join in efforts to assist with emergency needs, especially during this time of trial for people in Japan, I welcome your suggestions. By the way—I think this is also a way to inculcate your values into your family culture. Love, self-sacrifice, patriotism, and other values can be reinforced with careful attention to the motives that lie behind our concern for others less fortunate or differently blessed than ourselves. Permanently Lost in Digital Reality? Technology addiction is a serious affliction today. But how serious? Matt Richtel, writing for The New York Times, examines the possibility that the brains of today’s young people are being wired to function differently, if not better, than the brains of all previous generations of humanity. The critical difference is the use of technology to process information. His article “Growing Up Digital, Wired for Distraction” makes a convincing case. And the picture he paints isn’t uniformly attractive. I recommend Richtel’s article to parents, educators, and even teenagers. If teenagers can read to the end of the article and comprehend its basic message, then things may not be as dire as they seem. Tonight—4 November 2010—is the 21st Annual Banquet for the Whittier Pregnancy Care Clinic. I’ll be attending with my family to support this vital service to the southern California community. My family had the privilege of acting in a short film that has been produced for tonight’s event. Our home was used for filming, as well. The American President that most fascinates and inspires me is Theodore Roosevelt. I’ve read several biographies, the best of which is by Texas A & M historian H. W. Brands. I also enjoy collections of TR’s essays and letters. I agree pretty well with your views of David Copperfield. Dora was very cunning and attractive, but I am not sure that the husband would retain enough respect for her to make life quite what it ought to be with her. This is a harsh criticism and I have known plenty of women of the Dora type whom I have felt were a good deal better than the men they married, and I have seen them sometimes make very happy homes. I also feel as you do that if a man had to struggle on and make his way it would be a great deal better to have someone like Sophie. Do you recollect the dinner at which David Copperfield and Traddles were, where they are described as seated at the dinner, one “in the glare of the red velvet lady’ and the other “gloom of Hamlet’s aunt”? I am so glad you like Thackeray. “Pendennis” and “The Newcomes” and “Vanity Fair” I can read over and over again. If TR felt he could read such titles by Thackery over and over again, it is because he did. Thackery is mentioned in many of his letters. Here the father takes pleasure in a shared enthusiasm with his son. And why is he so pleased with the boy’s reading predilections? Apparently because of the power fiction has to form character, to provoke thought about values and truth, and to encourage wise decisions in life. Evidence for this dominates the quotation. Notice that TR is, in effect, counseling his son about choices in marriage. He is very subtle in this. It’s pleasing to see that this accomplished public figure had such a relationship with his children that he would write about such things in his letters from the White House. He takes time for his children in the midst of major official responsibilities. He writes in a slow, reflective pace. He engages his son in discussion of ideas and values on the basis of a shared interest. He shows genuine enthusiasm for great literature outside his range of responsibilities. He exemplifies a manner of reading fiction that is directed by the desire to grow in wisdom. He advises the young without preaching at them in any condescending fashion. He regards his son as a peer in the realm of ideas. He looks for points of contact between the fictional characters he meets with in reading and living individuals he knows personally. It’s enough to make you want to go back and read David Copperfield, and check out the works he cites by William Thackeray. Kindle users should know that there is a Kindle collection of over 100 of Thackery’s publications (including the three mentioned in this post) that you can get with a single purchase (cost: $4.79 at the time of this post). Click here. I like the Kindle! The quotation is from page 80 in The Letters and Lessons of Theodore Roosevelt for His Sons, edited and compiled by Doug Phillips. Isaac Watts (1674-1748) is best known as a great hymn writer. But his two books contain much timeless advice for the education of children in piety and critical thinking. J. Budziszewski is a Christian author and professor of government and philosophy at the University of Texas. He converted from Marxism to Christianity and has written these two books to guide Christian university students through the thickets of their “higher” educational experience. American philosopher John Dewey (1859-1952) was a leading figure in the pragmatist movement in philosophy, and is well-known for his work on the philosophy of education. If used with caution, parents will find much wisdom in his book on How We Think. Three books are listed here for the exceptional value they offer in areas related to logic and critical thinking. I recommend beginning with D. J. McInerny for an overview of issues related to the nature of truth, evidence, logic, and good judgment. The book by Bowell and Kemp is an excellent textbook—the best of breed, in my opinion. Parents should learn this material early, and lead their children through a close study of its principles before graduation from high school. The book by C. Allen and M. Hand is a useful reference work. The book by Norman Geisler and David Geisler explains the challenges of relativism and postmodernism and offers practical advice for combining critical thinking with conversational skill in dialogue with nonbelievers. Here are two additional books to consider: How to Read a Book, by Mortimer Adler, and Study Is Hard Work, by William Howard Armstrong. Finally, for general wisdom on the cultivation of the mind, I highly recommend the classic by A. G. Sertillanges, The Intellectual Life. I know from experience that children think deep thoughts and come up with the most difficult questions. Throughout their childhood, my daughters plied me with questions about the nature of the universe, the existence of God, whether we have souls—that sort of thing. I have always been amazed by two things as a parent and a university professor. First, grad students in philosophy ask questions they probably had when they were three to five years old. They had’t forgotten the answers; they had forgotten the questions. Second, the quirky solutions young kids reach in answer to deep intellectual challenges are seldom more quirky than the ideas of philosophers and theologians about the same things. Come to think of it, their answers often bear a remarkable resemblance! I’m not the first to marvel at this. My friend Jim Spiegel also teaches philosophy. He has twice as many children as I do, and they’re about half the ages of my kids. And his kids don’t let him relax from doing philosophy when he comes home from work. Fortunately for us, he’s written a spanking new book about his experiences in this arena. It’s called Gum, Geckos and God: A Family’s Adventure in Space, Time, and Faith. My copy just arrived and already I’ve read the first forty pages. Jim is a talented writer and an insightful parent. He can tell a good story, and this book is loaded with them. He’s funny, too, and self-effacing. If you have children or grandchildren, or know someone who does, and you haven’t given up asking questions about faith, I think you might enjoy and grow wiser reading this book. 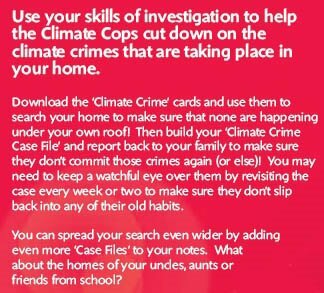 Sometime soon, the Climate Cops may be pounding on your door, if not breaking your windows, to make you answer for your anthropogenic global warming (AGW) misdeeds. Who are these Climate Cops? Three animated kids named Skye, Will, and Oscar, and a polar bear called K’eyush—together with their recruits from the world of real children. your worth by completing these three missions.” Each mission is played online. I learned about this from a post by Anthony Watts, titled “Hey Kids! Be a ‘Climate Cop’—rat on your family, friends, and classmates.” Watts re-posts an item from the EU Referendum blogspot. 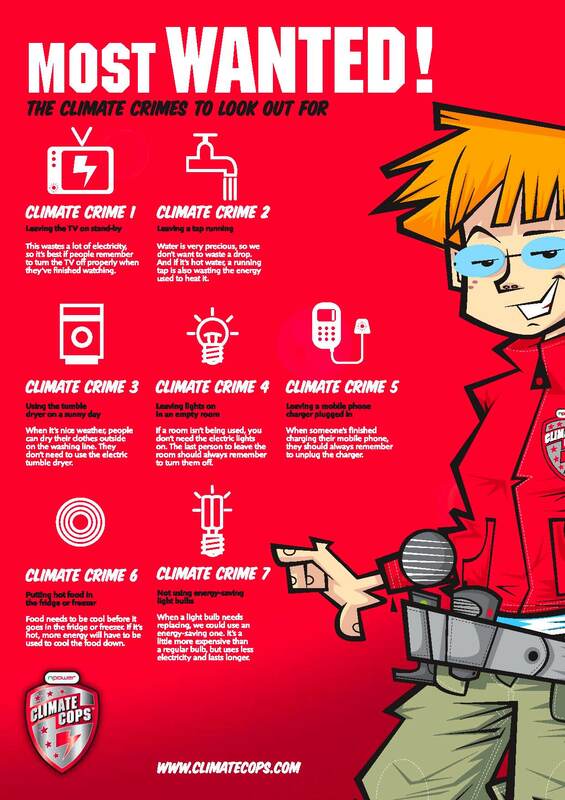 This item, titled “Climate Nazis,” reports on full-page ads that appeared in Britain’s Sunday papers yesterday. To their credit, the EU Referendum and Anthony Watts have posted these items to make people more aware of the ludicrous, and indeed shameful, effort to lure children into a campaign to spy on family members and others. They are truly alarmed by this, drawing analogies with Hitler’s propaganda campaign Deutsches Jungfolk. And the folks at the EU Referendum are answering the newspaper ads with an official complaint to the Advertising Standards Authority (ASA) in the UK. It is heartening to see the many comments responding to these posts by Anthony Watts and the EU Referendum. Most express disenchantment with the Climate Cop concept and the whole AGW paranoia for which we can thank former Vice President Al Gore. I believe our schools are deliberate accomplices in the effort to stigmatize the behavior of parents. This is a serious matter. It requires the substitution of education with indoctrination. It feigns respect for critical thinking, but reinforces sloppy and irresponsible judgment. This presents parents with an unprecedented responsibility and a severe dilemma. Parents cannot count on the schools to educate children in the skills of critical thinking. It is now their responsibility to instill virtues of the intellect, without the help of our educational institutions. Here’s the dilemma. If parents educate their children to be critical thinkers, their children will begin to wonder why they’re being sent off to school, where the values of critical thought are disregarded, if not distorted.